Since they are children’s toys, dolls are a heavy wear-and-tear item and are often prone to worn and broken pieces, especially on the face. When a doll’s eyes are broken, a convincing and attractive repair job requires both finesse and ingenuity, whether the doll requires simple repainting, basic eye replacement or a full rebuilding of the face. The simplest type of doll eye repair is re-coloring. 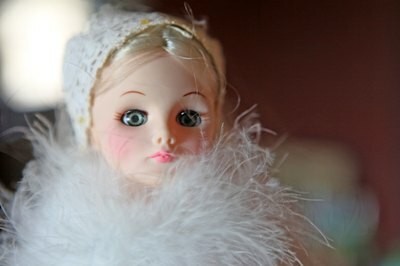 Many dolls made of hard material, especially porcelain, wood and plastic, will have painted-on eyes and those colors fade or rub away over time. Look carefully at what remains of the eye paint and choose a paint or ink that will make for a good match. 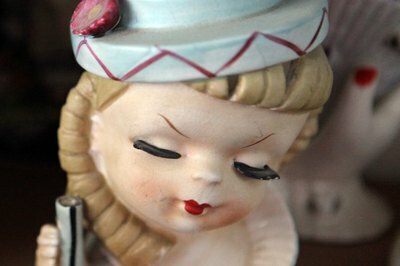 If the paint is shiny (as it is on glassy china dolls), choose an enamel paint. For most other dolls, a high quality acrylic will do. In some cases, however, it is impossible to copy the exact paint color and texture for spot painting. In these situations, you will need to fully repaint both eyes. Before you do this, scrap away any flaking paint. 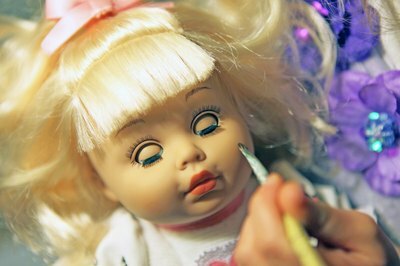 Paint the doll’s eyes using the finest tip paintbrush you can. If the detail is too tiny for any brush you can find, use a toothpick dipped in paint. For doll eyes painted in all black, you can often fix tiny bare patches with nothing more than a fine-tipped permanent marker. Dolls whose eyes are made of separate, glass orbs will generally need to have those orbs replaced. Replacement eyes are available in craft stores, as well as any specialty doll making supplier catalogs. Since eyes attach from the back of the sockets, you have a small amount of wiggle room when it comes to buying eyes that are a precise match in shape and size. It is best to get the closest match you can. Whenever possible, buy eyes that are sold as two separate pieces rather than a single unit, since this will let you adjust the distance between the eyes. To replace the eyes, you must remove the doll’s head. If this is not possible without breaking the doll, you will need to explore other options for replacing the eyes (such as popping them into the inside of the head and rebuilding them from the outside). Otherwise, use a thin, metal tool (such as a screwdriver or nut pick) to pry out the eyes carefully. Put the new eyes in place using a pair of thin needle-nosed pliers, but first apply glue to the rear, outside edge of the eye sockets. 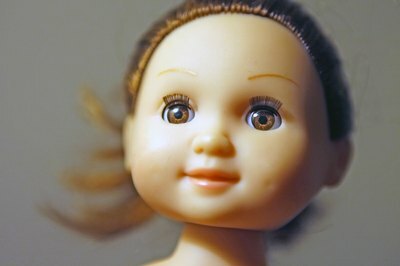 When a doll’s eyes are a sculpted part of the face and need to be repaired due to a chip or hole in the material, the best way to fix them is to find a compatible, moldable craft material with which to fill in the space. Some common materials that make for good matches are porcelain-look earthenware clays for porcelain dolls, Friendly Plastic for hard plastic dolls, liquid latex for soft-plastic dolls and wood putty for wooden dolls. It is unlikely, however, that you will be able to create a seamless patch job; decide if you are OK with this. Consider repainting the doll’s entire face to make it visually consistent.